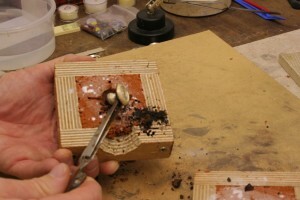 This is a photo journal/photo diary on how to cast sterling silver using delft clay. 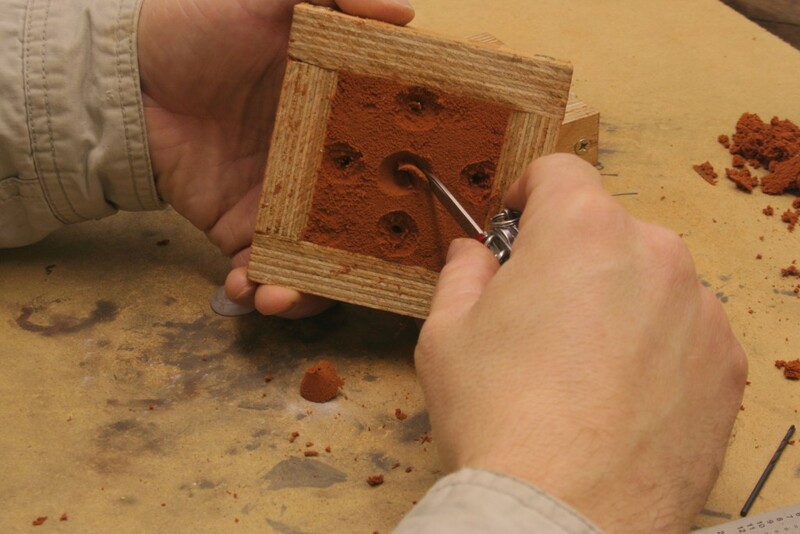 Delft clay casting is not a mass market methodology but is more useful to independant jewellery designers that wish to make cast designs infrequently. 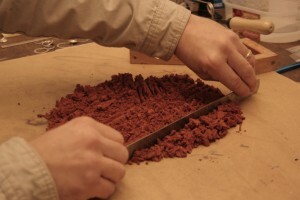 There is also the lost wax method but that is more aligned to making large numbers of items or indeed large objects. 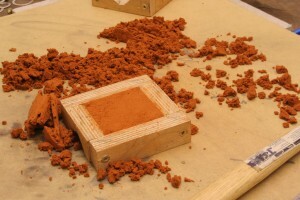 This journal explains the delft clay technique step by step. 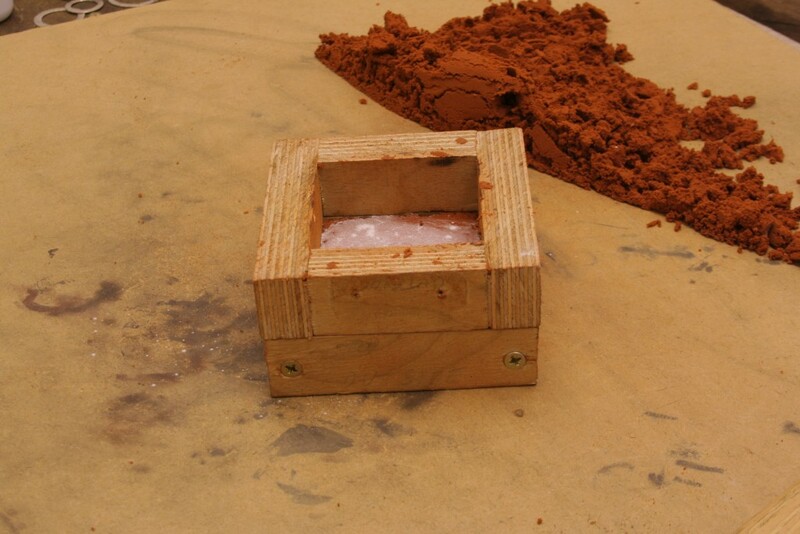 The items you need to cast are as follows:- item to be cast, crucible to heat the silver in, delft clay (a type of sand with oil additive), talcum powder, blow torch, metal ruler, hammer, borax powder and of course casting rings. Most people buy aluminium casting rings that cost around 25 to 50 pounds. While they are very good and serve most purposes I made my own out of some scrap plywood I had lying around my garage. As long as you can make the parts of the casting kit that always join together in exactly the same way then you can use them to cast with. 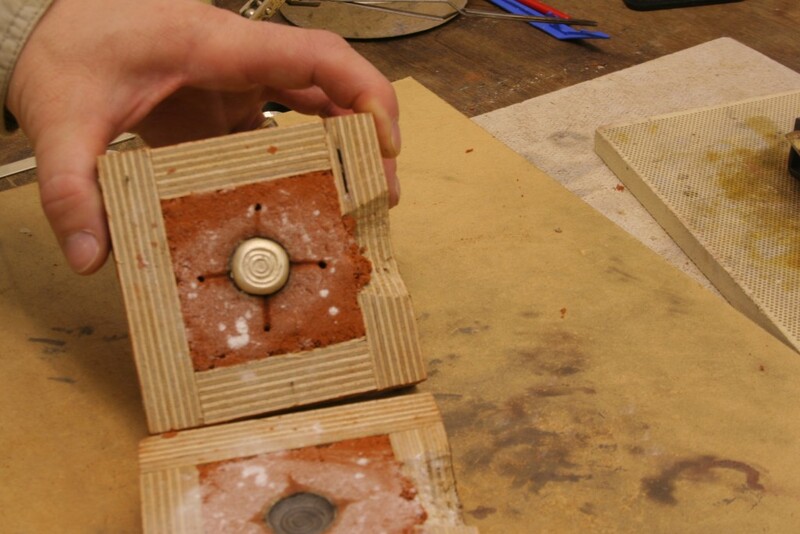 My wooden kit has two pins that have zero tolerance so my casts are always perfectly copied. 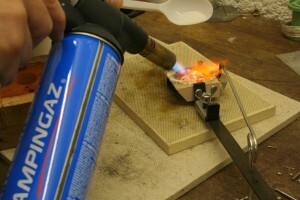 The other advantage in making your own casting kit, I can pour my molten silver either from the side or from the top. I can cast either solid objects or rings/long objects with ease. 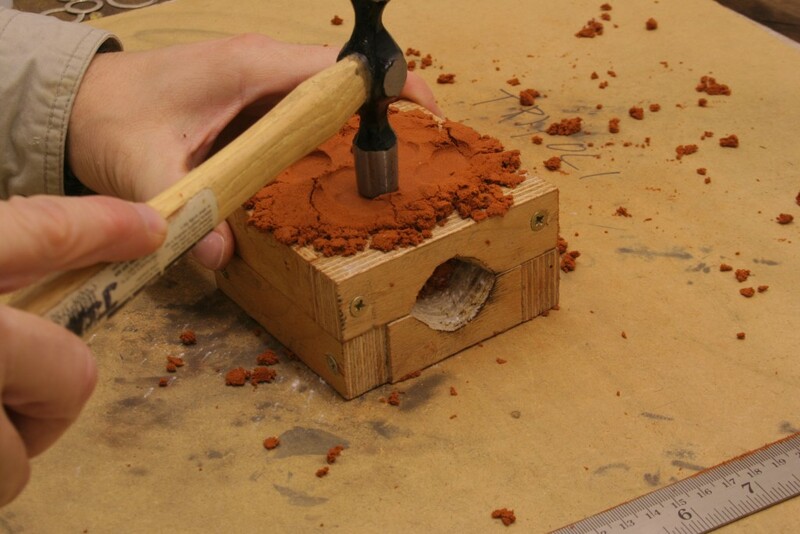 When using delft clay casting the object we wish to reproduce can be made of a variety materials. 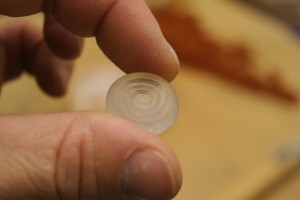 The most common is wax that is carved into shapes. You can also use objects like dominoes, stones and other items that don`t have internal holes. 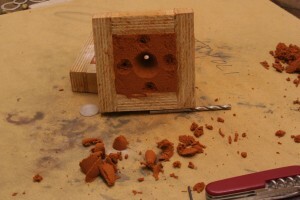 Holes don`t cast easily unless planned carefully in advance. When I have something I want to cast time and time again I like to carve my objects out of perspex. 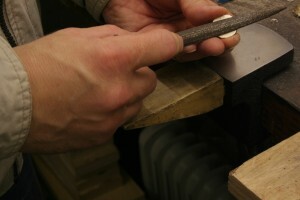 It is a very hard wearing material that can be scrapped, cut and sanded like wax can but takes much longer to work. Wax is much softer than the rigid perspex. Right lets cast a silver pendant. I have been chopping left and right, top to bottom and then repeated again to get quite reasonably small pieces of delft clay. 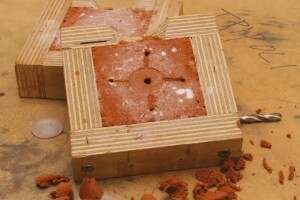 There is always a base casting ring. 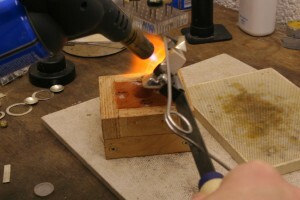 For me it is the part of the rings (I know its square but I`m used to saying casting rings) that do not have the locating pins. We must always put the edge that joins to the top casting ring down on our table. We don`t want to damage the joint face. 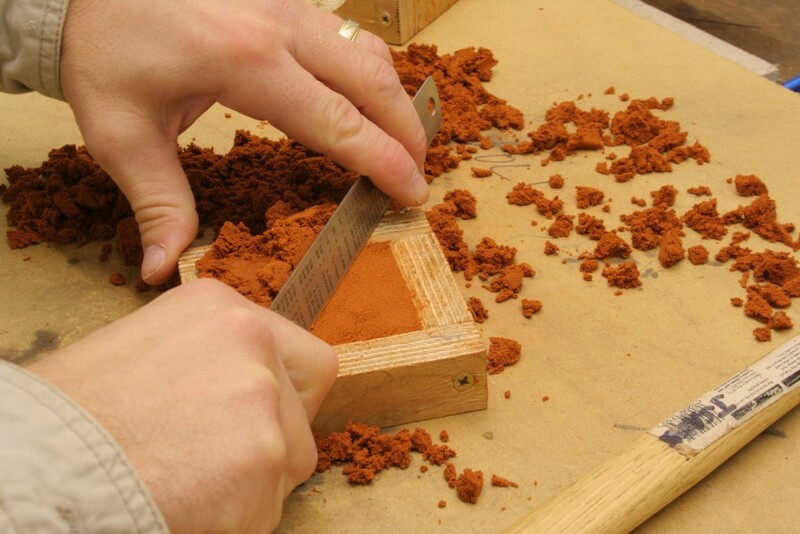 To make sure the delft clay is tightly packed we pile the clay high and then hammer it as much as we can. 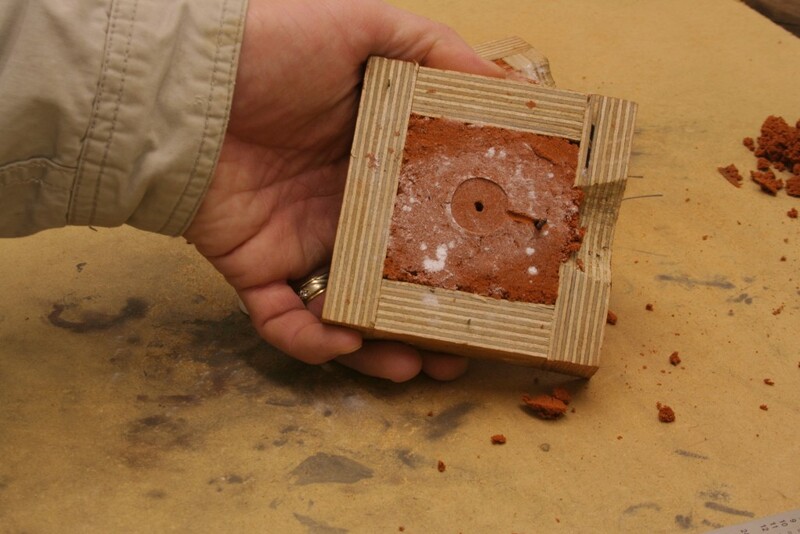 This is why the casting ring must be joint edge down. 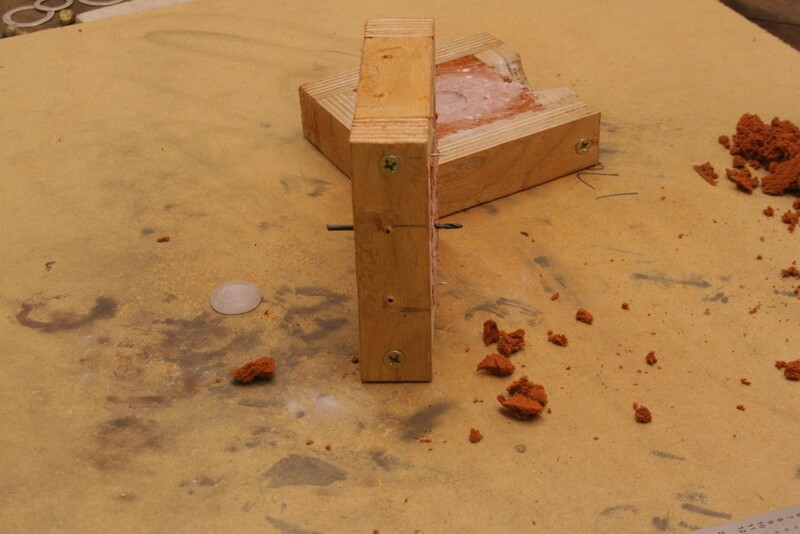 The hammer could damage our casting ring and I don`t care what happens to the outside edges of the casting set. I`ve hammered the clay down so it is packed hard making sure that their is a heap of delft clay that I can smooth off without leaving dips or holes. 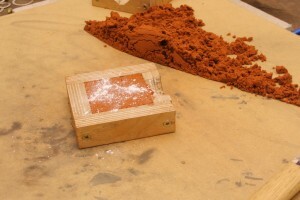 It is very important that the delft clay is flat at this stage. If there are bumps then scrap until flat. If there are depressions then go back one step and packed more delft clay in. Making a good cast requires that this part of the casting set is as filled as possible. Scraped flat and ready for the next stage. We need to use talcum powder on the delft clay so that once we push our item to be copied into the soft sand, the sand will not stick to the carved item. I have turned the casting ring the right way up now. You will notice that the wooden frame I have has a half carved conical shape. 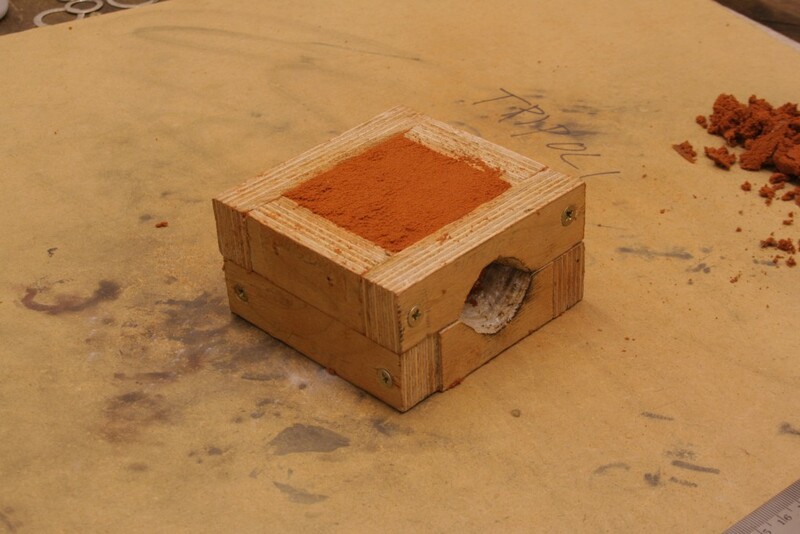 That is for casting from the top. We won`t be using that today, but we`ll make a pouring funnel in the clay side. Now, sprinkly talcum powder onto the delt clay. 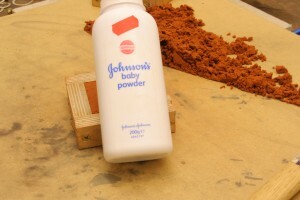 Use your finger to spread the talcum powder around the clay. 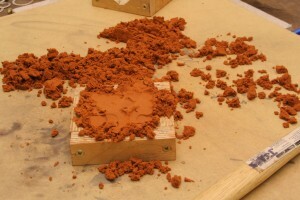 You can`t really use too much just spread it around until it covers clay. As well as stopping the clay stick to our object to copy, the talcum powder also prevents the next layer of delft clay sticking to this layer. Here I have the carved perspex shape ready to cast. 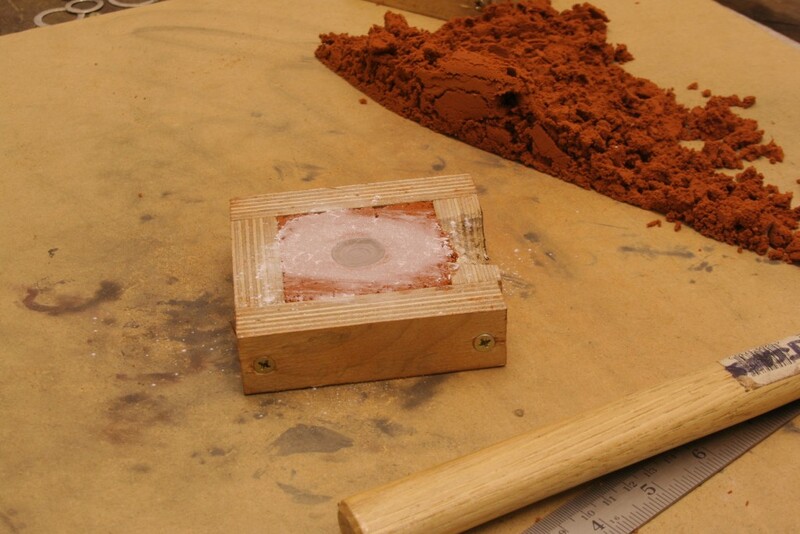 I carved, sanded and made it as smooth as I could as the casting will show imperfections in our cast object. 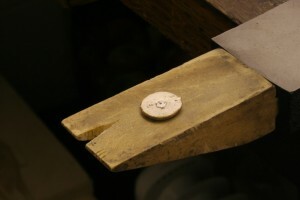 Pay particular attention to grooves that might be accidental slips with our carving knives/tools. They show very easily in shiny silver. I have pushed my object face down. In otherwords the part I wish to be decorative is pushed down. The back of my carved item is perfectly flat. 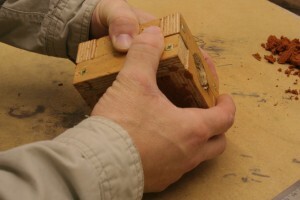 Sprinkle more talcum powder on top of the carved object and rub in. 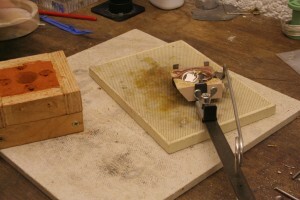 Then place the second casting ring on top making sure the alignment marks are in the right place. All casting rings have a method to make sure you can place the rings together the same way every single time. For my casting set I have 2 pins pushed into the wood but sticking out. They go into holes in my second half. They always join in the same way and very accurately. 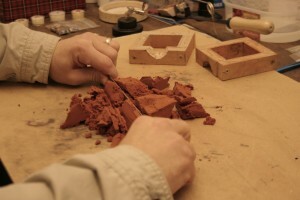 Now we put more delft clay on top and pack as before for the bottom half of the set. 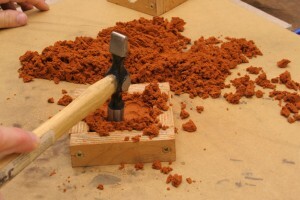 Hammer it to get a good packed mold. The tighter the packing the more accurate the imprint we make. Tidy off the second ring. It doesn`t matter so much if there are bumps and depressions at this part. We will be making holes in this top half anyway. Ready to see how our imprint looks. Lets hope for a good imprint otherwise I`ll be going back and doing it all again. Be careful as you pull apart the casting rings/set as an error now means you have to start at the beginning again. 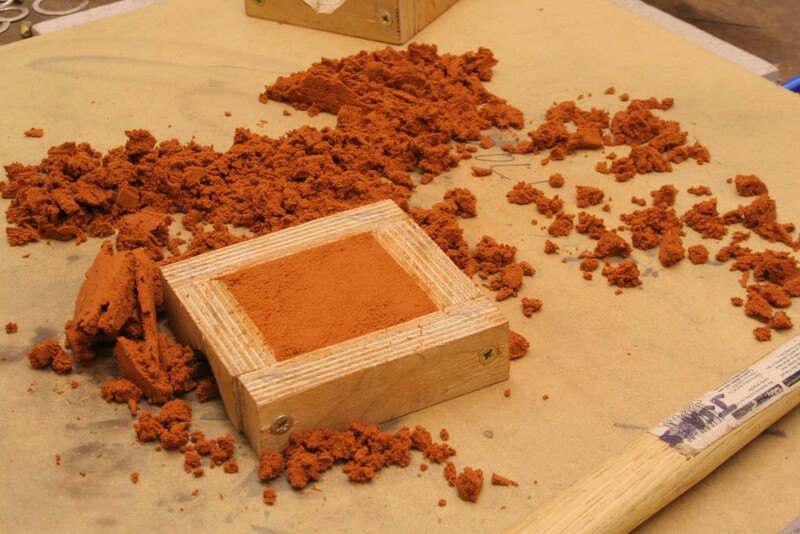 Delft clay is quite soft and you could quite easily damage the imprint you make. 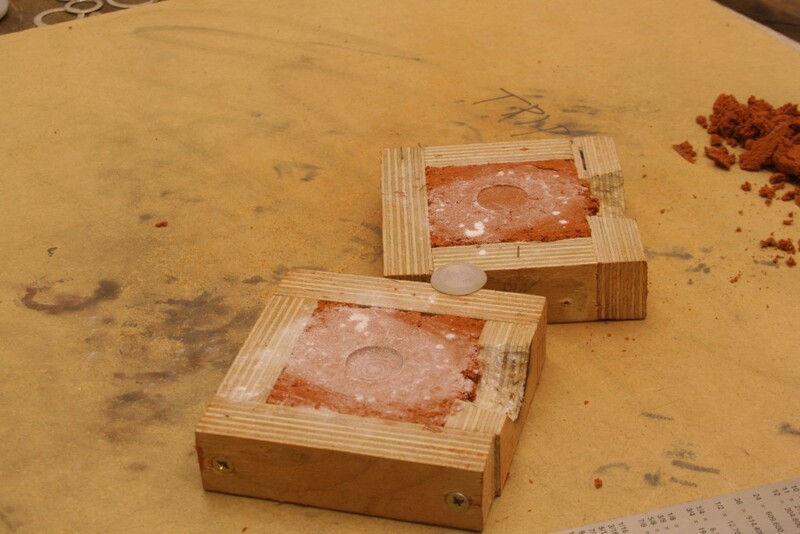 We have a good imprint so lets prepare for pouring in our molten silver. 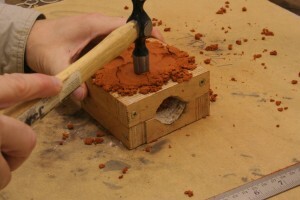 We start by making the hole that will become the pouring funnel in the top half of the casting set. The bottom part of the set shouldn`t need anymore work done it for now so move it out of the way. 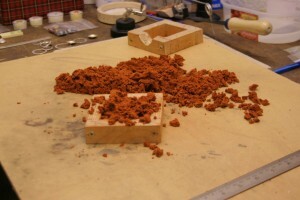 After the silver is poured in this funnel, it forms the main sprue that all castings are subject too. Now I make some passageways to allow air to escape while we pour in the molten silver. 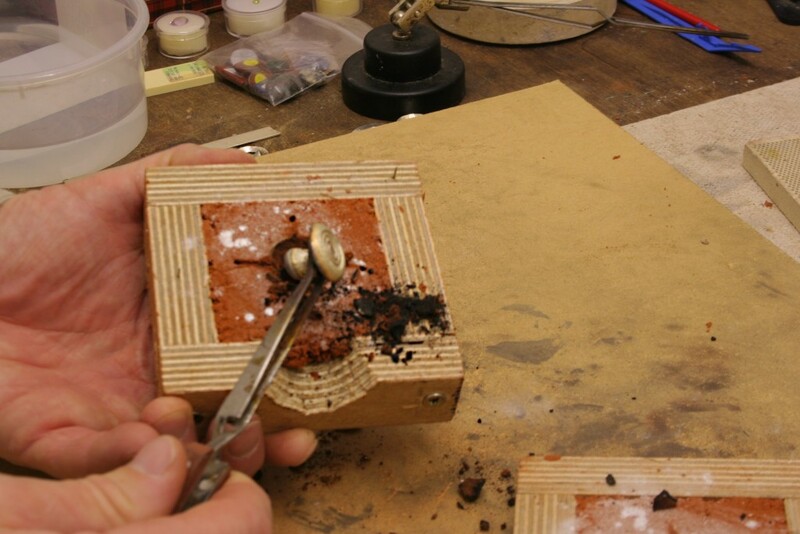 I am using a small drill bit to scrape some of the delft clay into channels. 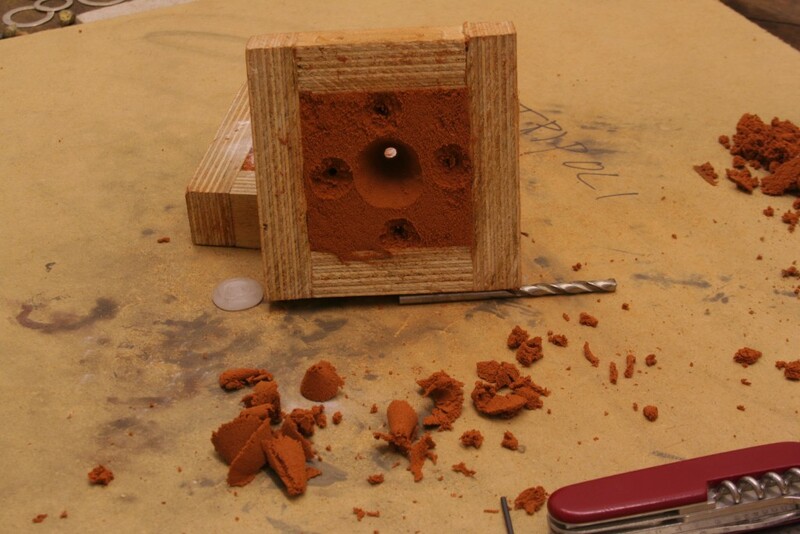 At the end of the channel push the drill bit through the delft clay. The airvent has to go all the way through the top casting ring. Try to make sure that no small pieces of delft clay are blocking the hole. It would prevent air escaping. 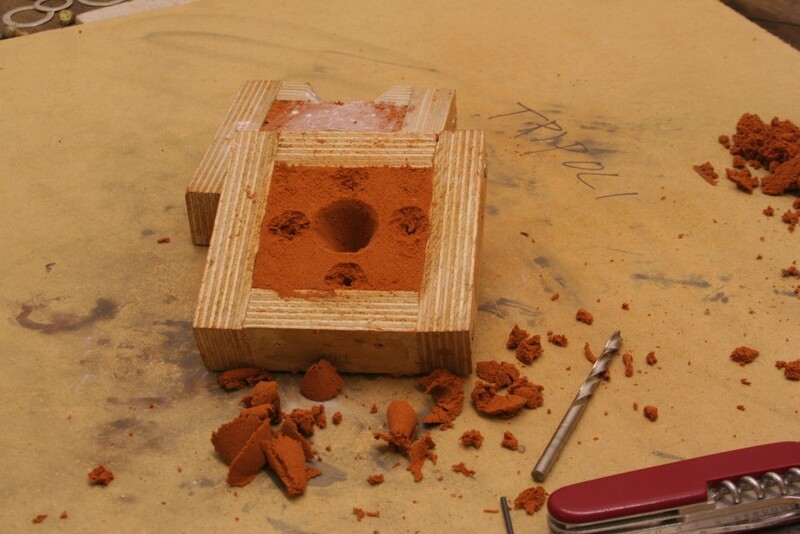 I have made 4 airvents for this casting. They are nicely spaced and should allow the silver to pour in and fill the area well. More complicated shapes with points for example would need airvents from the point ends otherwise the silver will not run to the whole length of the imprint. Now to finish of the sprue/pouring funnel. I am just using a swiss army knife to carve out the funnel. 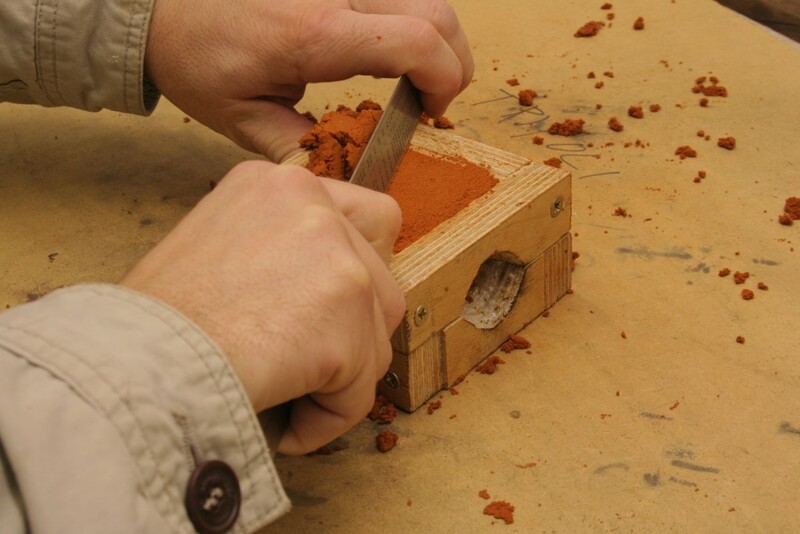 The delft clay is very easy to carve so just be careful not to carve the funnel too deep. You wouldn`t want to start at the beginning again would you? We have finished our pouring funnel. The sides are smooth to prevent our molten silver from delaying its decent into the imprint we have made. 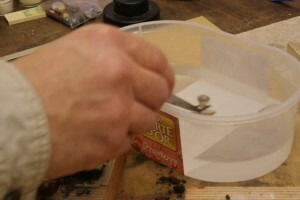 The base of the funnel needs to be around 4mm in diameter to give enough clearance for the silver to pour. It the base of the funnel is too tight your silver will only partly flow into the mold and you will have to go through all the stages again. It can be quite disheartening to open your cast to find a little stub of silver protuding with virtually all the rest stuck in your funnel. We are now ready to cast our silver. As the silver is starting melt I add some borax powder. It helps to melt the silver and getting it flowing. The silver is getting hot now, perhaps 800 degrees centrigrade. It is starting to soften and the top side is molten. By rocking my crucible side to side gently I have found I can get the silver to go fully molten more easily. The silver is now fully molten and kind of looks like a kidney bean in my crucible. 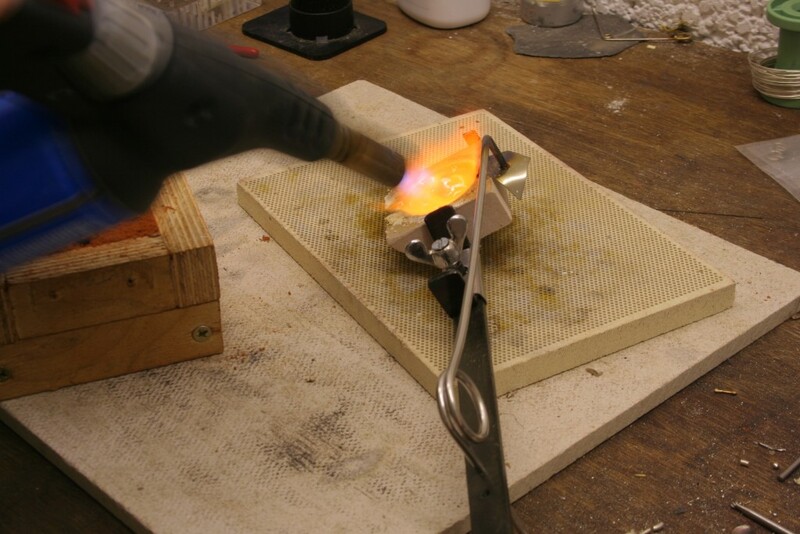 I keep rocking the crucible side to side gently which helps to get more and more heat into the molten silver. 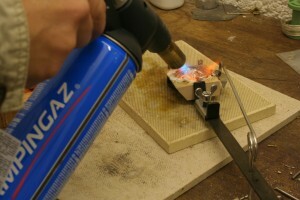 If I take the flame away the silver would go solid in moments and I would have to add more heat. Keep the flame on the silver as you lift the crucible into position. 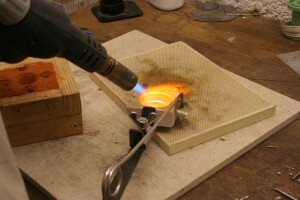 The flame will be present during the entire pouring. Again it helps to keep the silver running and helps make a better cast. Lets have a look at the cast. Be careful here as the silver is hundreds of degrees and would burn you instantly if you touch it. After a while quench the silver to take the remaining heat out. It is now ready to handle. Cut of the sprue with your piercing saw. Only a couple of steps left. 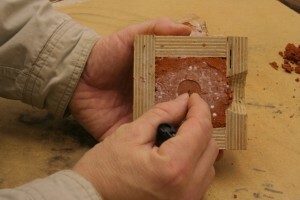 I file down the back of the cast and take the rough edges off. 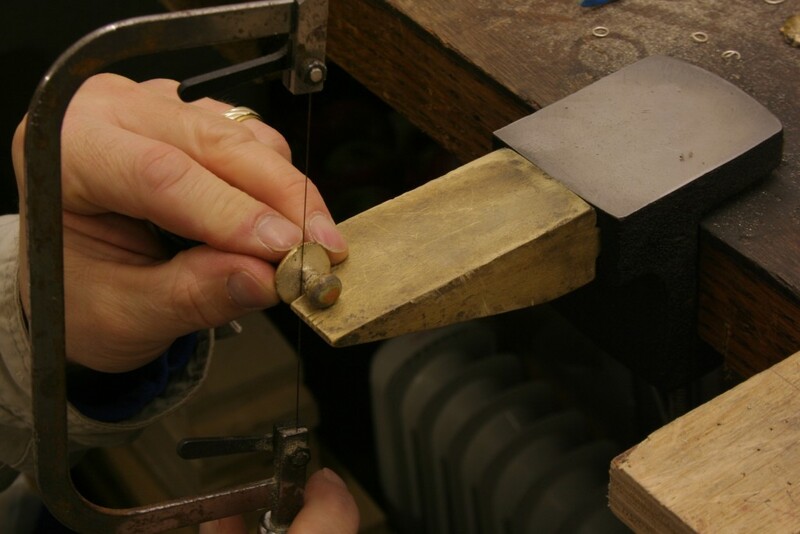 I then added a bail, popped it into safety pickle to remove the firescale. A quick scrub with pumice powder a polish and then! 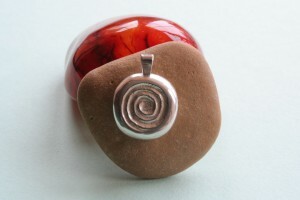 The finished pendant. Nice right?